Life is never dull, eh? I feel like my life is in a near-constant state of busyness nowdays — I am sure many can relate. Right now, there are two oncoming changes in my routine that I am glad for, that represent a shift in how I will be tackling the discipline of studying scripture. Our small group just received our copies of the book God’s Devil, by Erwin W. Lutzer, and will be going through it together. It is supposed to be about the place of the devil in God’s plan, which is clearly a tricky subject to tackle. So, hey, let’s study more about Satan. Sure, why not? A lot of Christians tiptoe around the topic, and that can be dangerous. So too, though, is the tendency of some to grant Satan too much power. Ultimately, Christ prevails. This should be an enjoyable course of study. Okay, this is a big one. Since 2008, I have been helping to teach the grade-school students at church. It was just once a month, but it was certainly a consistent responsibility and a colorful part of our church life as a family. However… that age group has always been a weakness for me. As much as I love teaching roles, and as equipped as I am to adapt messages for different target audiences, I just cannot muster a passion for facilitating spiritual discussion with 8-year-olds. It is not my gift. I recognize. So when the opportunity kinda opened for me to politely say “hey um can I do this” about teaching the middle/high schoolers instead, I made inquiries, largely thanks to encouragement from my wife. And, here we are, I start on Sunday! The Westminster Catechism may be a head-scratcher of a subject for many people (why the heck would you devote a weekly class to that? = a fair question), but I feel so good and warm about it. I grew up with the Heidelberg Catechism myself, so I am excited that this will even just be a great opportunity for my own personal growth in knowledge. But even besides that, I am thrilled to be put back in a room with teenagers, an age group I have always had a lot more zeal for, and prior awesome experiences. I am looking forward to amazing conversations, along with my own gains in spirituality as well. I am no great authority, and claim no superior wisdom. I just have thoughts. I have read a couple social media posts like this today, and I can only answer: When human beings began living in it. As long as humans occupy a space, awful acts will happen in that space. This is a perpetual truth, with a veracity that is interdependent of your distaste for it. In other words: It is absolutely true, even if you do not like my saying so. Whether it is violence against indigenous, blacks, gays, etc. — brains too small to comprehend individuality will overemphasize differences in groups and labels to a potentially dangerous extent. You can certainly see a history of this violence in America, along with acts more random in their targeting as well. I see no reason why it would cease any time soon. For Americans to claim there is no solution to mass shootings is to ignore the existence of entire countries where they occur at a statistically significantly lower rate. 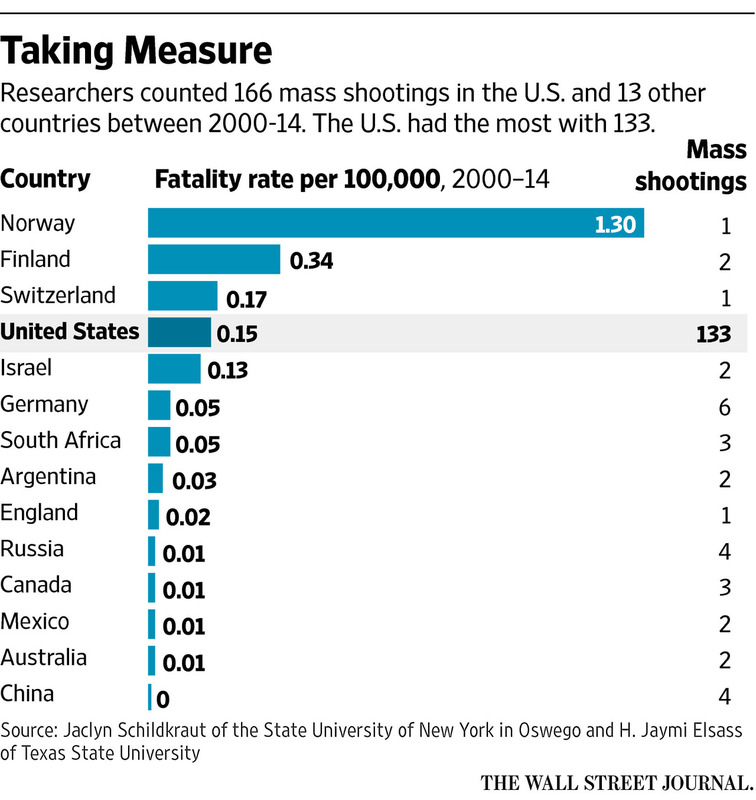 For example, Canada and Australia, combined, had 5 mass shootings in the years 2000 through 2014. If there were less guns, there would be less shootings. That is math, not ideology. Let me address any counterpoints with a single, simple question: In a world with 0 guns, how many shootings would there be? Of course, in America, yanking guns away from its citizenry is no longer a realistic measure nor a politically attractive message. I just wish those who were so passionate about guns would be honest enough to admit that mass shootings occur because of them. There is plenty of room for great conversation around opinions such as “I believe Americans should have the right to own firearms, but mass shootings are terrible.” I can respect such a view (and basically hold it myself). However, I would remind people that the ideas of gun rights and gun consequences are inseparable: As long as people own guns, some of those people will use them to murder other people. If you believe those people should have the right to own the guns they are using to murder others, at some point you have had to either reconcile this inseparability with yourself or you have ignored it altogether. I suspect that many “gun nuts” have a fondness for weapons that outweighs their compassion. I wonder if one could be honest, then, and say, “Hey, I do not mind if there are mass shootings. I understand this is an inevitable consequence of humans having guns. I just believe that the benefit I gain from having one myself is greater than such costs incurred elsewhere.” Some probably have, to some extent or another, I guess. Phrases such as “guns don’t kill people” are meant to instill a sense that guns have no inherent moral standing, that they are merely a tool like a hammer or a screwdriver that is potentially misused for violence by a wielder of ill intent. Consider, though, that the intended function of a gun is to harm. Again, I am not entirely anti-gun; after all, if you need to bring deadly force on a target, a gun can be a very effective option. I suspect that the most staunchly pro-gun advocate would still at least agree with the idea that guns are to be taken seriously, not lightly. The nature of guns is perfectly suited to the nature of humanity: Both are inevitably destructive. Anything can be an idol. I do not believe it would be a stretch to say that many Americans worship guns, and/or the country itself. The bizarre juxtaposition that America often has between its militant patriotism and its God-Bless-America Christianity is an odd brew, for sure. I often get the feeling that many Americans would be surprised to learn that the Bible has very little to say about this country, specifically. The sentiment that God should bless America in some special sense is a strange one. Again: I am not saying America is not a great country full of fantastic things. I am grateful to live here. I have no intentions to move out, no matter who wins the big election. I think it is okay to have a nuanced, admit-its-faults opinion of this country, or often other subjects, rather than immediately kneejerk to one side of a very black-and-white spectrum. Neither ‘side’ of these debates are ever innocent, after all, as much as they like to act like they are. Seeing people call for Muslims not to be judged as a whole due to the actions of one seem to conveniently forget this sentiment when railing against Christianity, but any Christian who believes a difference in faith makes all of that faith’s members perfect are profoundly unaware of the message of the Word they purport to follow. Lord knows Christians spew plenty of venom following violent events. As I have tried to make clear: I can respect responsible gun ownership, I can be fond of America, I just feel a little saddened by some of the thoughts I see expressed out there, too. A world without guns would have a lot less shootings — but I can acknowledge the reality of the complex world we do live in, the one with guns, one that has many different issues intersecting with any particular person or time. Lots of people who are passionate about lots of things may be served well to take a breath and consider their words before lashing out in response to the latest news cycle. Perhaps I am possibly only adding fuel to the fire by blogging about such issues. I am a cynic, but I also believe people are capable of greatness, I promise. I am imperfect. I do not have supreme answers. But many seem to think that they do, and that is disheartening. I would love to see more people admit that stuff is complicated and they do not know everything. Saddest to me, though, might be my fellow believers who are quicker to jump to the defense of guns than they are to the cause of Christ. So I have to wonder: As a Christian, what is my proper response to tragedy? There is room for thought and conversation there, as well. There will be other opportunities, for sure. “But avoid foolish controversies…” — Titus 3:9. “Cast all your cares upon Him, for He cares for you.” — 1 Peter 5:7. “The grass withers and the flowers fall, but the word of our God endures forever.” — Isaiah 40:8. “… what does the Lord require of you? Do justly, love mercy, and walk humbly with your God.” — Micah 6:8. 1) The internet, by enabling instant access to people and information regardless of physical location, has been so monumental in shifting world culture that we have only barely begun to comprehend the extent of its impact. 2) There will be cumulative consequences to society as we encourage more and more people to be able to essentially live their lives entirely without face-to-face human contact. As flesh-and-blood beings who exist in a real space and take part in a “complex whole” of populated organization largely built by these empirical interactions, there will inevitably be unforeseen effects. 3) There are surprising ways that the online ecosystem actually enhances moments of personal compassion in ways that the offline cannot [ as readily ]. One example I have considered: Increasingly, you can find Twitter accounts of people who are now deceased. I would have never known of their existence had it not been for the internet, and by browsing their feed, I am offered a much closer look at their life than what would be available in a simple obituary, thus adding to the impact of their absence. 9. Knock some teeth out. 10. Receive a bleeding wound. This song came to my mind recently. I really like it. On Sunday, pastor Paul preached on Colossians 3:1-4. He spoke of the journey to live in a Christ-centered fashion, setting our hearts on things above, etc. At one point, he mentioned this idea of having songs in mind, songs that speak truth when you need it. There are many classic hymns I enjoy, and other songs I could write about, perhaps revisit someday. But today, I want to talk about Do Not Move. Released in 2005 on the A Collision album (which is a superb experience overall), Do Not Move is a fun little foray into the sometimes-beleaguered Christian rock scene. Stuffed full of crunchy guitar work, synth oddity, and swelling vocals, DNM is a distinctive track — unusual, even. You can appreciate it at face value for its bold sound or consider its words for personal interpretation. In my case, it holds sentimental value as well. I like the way the words play with dichotomy: Costly death set against wondrous hope. Think, move. Could, should. For me, the themes of stillness and breathing bring to mind Psalm 46:10: “Be still, and know that I am God.” This is a good reminder for me. I first encountered Do Not Move back in my days as a summer camp counselor. We used it for a skit that a handful of us performed as part of the opening ceremonies for the overnight session each week. My role was the part of a demon. Throughout our performance and its Crowder-fueled cues, my tale was that of a tempter who successfully captured a human soul, only for my evil plot and that of my demonic comrades to be outdone by the overpowering work of Christ, despite our efforts to beat and even kill the illustrious interloper. Quite a story arc to cast against 326 seconds of background music. I suppose that sort of raw efficiency fits within the grand tradition of Gospel Presentations Intended for an Audience of Youth, though. I always enjoyed those sorts of plays. Perhaps even excessively, at times: I remember being told one week that it was “a bit much” when I used black face paint to draw upside-down crosses on my cheeks. If I wish to, I can remember the that stage in these opening notes, in that chapel, in front of a captive audience, trying to bring myself to serve earnestly in that moment, in that ministry. If I am honest, I can recall it pretty darned vividly. Nowadays, I would just as gladly accept being ministered to, and it is in the day-to-day present labor that this tune can still play a part in my life. My stage is no longer in a summer camp chapel, but in my workplace, my home, and elsewhere, all the while still called to perform, in a way. Ultimately, however, I am fond of this song simply for its energy, the way it… compels me to move (!). There are plenty of other musical examples available for this motivational purpose, even in the worship arena, but this one has stuck with me especially. I believe that Jesus encompasses more than we could ever fully discuss. In my own modest attempts to encapsulate the Almighty, there is one particular tidbit I keep coming back to. If you have known me for long enough, this is likely a bit you have heard before. When I was a child, I heard about this idea that Jesus could do anything. I would hear this expressed in classic Bible stories: Jesus can grant sight to a blind man, he can walk on water, he can even raise the dead. “With God, all things are possible.” This is the verse (Matthew 19:26) they unpack in Veggietales’ Dave and the Giant Pickle. In this segment, Larry the Cucumber is shown to struggle with this thought as he asked, in a way I found unforgettable, “Do you think God would turn me into a chicken?” Why not? God can do anything, yeah? In an interpersonal sense, we learned that when we pray, Jesus hears us. There was no limit on how many people he could hear, or what languages he understood. This Savior we learned about was an all-powerful, limitless figure. How could a child, a boy like me, wrap his mind around that grand concept? … Honestly? Whenever I came across the sentiment of Jesus being able to do anything — I always imagined him doing cartwheels. I would visualize myself looking out the living room window and catching a privileged glimpse of Christ performing effortless, flawless cartwheels in our yard. Why? Because I couldn’t do cartwheels. [ Still can’t, as long as we’re being honest. ] I think there is a lot to be said on the idea that we often measure God against our weaknesses (the Bible may even speak to this as well, hm), but as a kid, that was the illustration I gravitated toward for years to come. Jesus doing cartwheels. Because I couldn’t. That’s kinda silly, right? Childish, even. I can’t help but still think, though, I guess, just sorta wonder a little bit, if Jesus will greet me in Paradise with a deft little cartwheel. Can you imagine that? Just for me. Just to delight me all the more, in a way only he could. I can see him yelling “ERIC!! !” across a palatial courtyard, with an impropriety only an old friend could muster, before catching my sight and performing that long-awaited divine cartwheel, my Heavenly eyes watering with joy beyond measure before we embrace in a fit of fond laughter. I mean, I doubt that’s how it works; but, hey, Jesus can do anything.